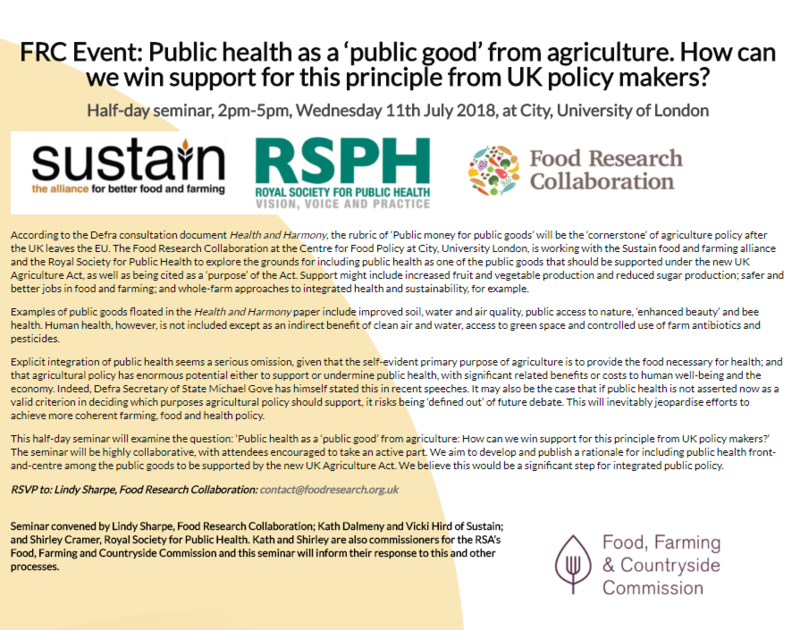 FRC Event: Public health as a ‘public good’ from agriculture. How can we win support for this principle from UK policy makers? According to the Defra consultation document Health and Harmony, the rubric of ‘Public money for public goods’ will be the ‘cornerstone’ of agriculture policy after the UK leaves the EU. The Food Research Collaboration at the Centre for Food Policy at City, University London, is working with the Sustain food and farming alliance and the Royal Society for Public Health to explore the grounds for including public health as one of the public goods that should be supported under the new UK Agriculture Act, as well as being cited as a ‘purpose’ of the Act. Support might include increased fruit and vegetable production and reduced sugar production; safer and better jobs in food and farming; and whole-farm approaches to integrated health and sustainability, for example. Examples of public goods floated in the Health and Harmony paper include improved soil, water and air quality, public access to nature, ‘enhanced beauty’ and bee health. Human health, however, is not included except as an indirect benefit of clean air and water, access to green space and controlled use of farm antibiotics and pesticides. Explicit integration of public health seems a serious omission, given that the self-evident primary purpose of agriculture is to provide the food necessary for health; and that agricultural policy has enormous potential either to support or undermine public health, with significant related benefits or costs to human well-being and the economy. Indeed, Defra Secretary of State Michael Gove has himself stated this in recent speeches. It may also be the case that if public health is not asserted now as a valid criterion in deciding which purposes agricultural policy should support, it risks being ‘defined out’ of future debate. This will inevitably jeopardise efforts to achieve more coherent farming, food and health policy. 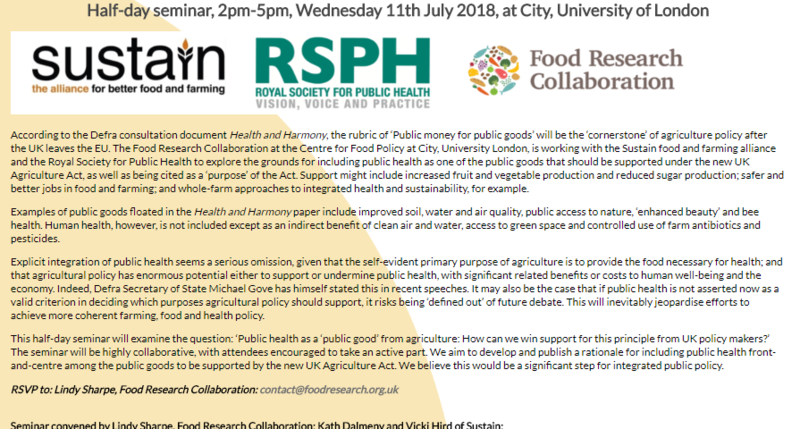 This half-day seminar will examine the question: ‘Public health as a ‘public good’ from agriculture: How can we win support for this principle from UK policy makers?’ The seminar will be highly collaborative, with attendees encouraged to take an active part. We aim to develop and publish a rationale for including public health front-and-centre among the public goods to be supported by the new UK Agriculture Act. We believe this would be a significant step for integrated public policy. Seminar convened by Lindy Sharpe, Food Research Collaboration; Kath Dalmeny and Vicki Hird of Sustain; and Shirley Cramer, Royal Society for Public Health. Kath and Shirley are also commissioners for the RSA’s Food, Farming and Countryside Commission and this seminar will inform their response to this and other processes.